Click here to read previous GTC posts. I wasn’t optimistic ahead of these results, so I was quite pleased when I saw the headline figures. Revenues advanced 16%, operating profits more than tripled, the dividend was lifted 5% and an extra £1m was added to the net cash position. I was also happy that these H1 figures generally matched the preceding H2 2014 achievement. Although these H1 numbers were not perfect (see below), I reckon GTC performed well in what the firm described as “difficult market conditions”. * Surprise — there was no profit warning! “We start the second half of our year with strong cash balances and a substantial pipeline of sales opportunities. “The very significant drop in oil price since mid-2014 has led to cuts in capital expenditure across the full range of exploration and production (E&P) companies and across the E&P business lifecycle. This has had a direct negative impact on the service companies, in particular those focused on exploration. Our previous experience of working through oil price cycles has led to a number of conclusions. First, the market can be difficult for a period of time. During this time it is important to focus on the key needs of clients and companies that are less affected by spending cuts. Second, short-term reductions in expenditure, and hence, activity, led to reduced reserves additions, and hence, a longer-term increase in activity. This observation gives us support for the longer-term prospects for the business. GTC claimed “strong demand for consultancy work” had supported these H1 figures. Meanwhile, the flagship Globe product — which supplies comprehensive data to clients through a three-year subscription — did not appear to attract any further customers. “We are continuing to build the Globe framework with the aim of making it the pre-eminent exploration tool for oil and gas explorers. During the first half of 2014 Globe had ten clients, which reduced to five when the second three-year subscription period began in July. I’m hopeful Globe’s new “additional functionality” can soon attract some more clients. I couldn’t help draw some parallels with Pennant International (PEN) after reading GTC’s cash-flow statement. For a start, both companies have successfully claimed R&D tax credits from HMRC — but I see only GTC has so far received a tax cash refund (a welcome £713k in these H1 results). Furthermore, both companies did have their working-capital issues during 2013/14 — but I see only GTC has reported a favourable working-capital movement of late (a sizeable £879k cash inflow in these H1 results). Plus… both companies have traditionally spent little on intangibles — but sadly GTC has joined PEN by suddenly deciding to capitalise a significant amount of development costs onto its balance sheet. Yes — the main drawback to these H1 numbers was that development costs of £482k side-stepped the income statement. Alongside the £196k spent on tangible assets, it meant a hefty £678k was spent on capex — which was way ahead of the £152k depreciation and amortisation charged to profits. ii) Past annual accounts have looked conservative — in particular, the previous five years have each witnessed cash capital expenditure completely covered by the depreciation and amortisation charged to headline earnings. Nonetheless, I will keep tabs on GTC’s development costs and be on guard for any cavalier bookkeeping. Accompanying the H1 results was news of an acquisition. GTC is purchasing an oil and gas consultancy called ERCL for an expected £4.3m. I’m on ‘amber alert’ with this deal because the expected £4.3m cost exceeds GTC annual profits. It’s a simple rule of thumb that I use to limit my exposure to boardrooms that may harbour grandiose expansion plans. iii) have realised their core business has run out of steam. How ‘exceptional’ the contributions from Africa were, though, was not disclosed. To help fund the deal, GTC has used its freehold HQ to secure a £1.1m loan — and interest at 2.04% plus base rate looks quite affordable to me. * As part of the ERCL deal, GTC will issue shares worth about £1m and its share count will rise to 32,492,814. GTC’s market cap will then be £15.9m at 49p a share. * Trailing operating profits now stand at £1,454k. Less interest of £28k on the new loan and tax at 8% (my best guess for GTC’s tax rate following all the R&D credits), earnings for the core business could be £1,312k. * If ERCL brings operating profits of just £400k and is taxed at 20%, the new subsidiary would produce earnings of £320k. * Total earnings would then be £1,632k, or 5.02p per share on the newly enlarged share count. * Net cash stands at £4,733k, of which £3,852k looks ‘surplus to requirements’ to me given GTC receives upfront payments from clients for its services. * Subtract the initial £1,750k ERCL payment and the expected £1,550k ERCL earn-out payment leaves £552k, or 1.6p per share, of ‘truly surplus net cash’. * GTC’s enterprise value (EV) post-ERCL purchase is the £15.9m market cap less that £552k cash, or £15.4m — equivalent to 47p per share. * The P/E on my EV and EPS guess 47p/5.02 = 9.4. The trailing dividend is 2.22p per share and supports a 4.5% yield. iii) The ERCL deal works out well. * I still like Getech for its proprietary data products, asset-rich balance sheet and ‘thin cat’ management team. But all the same, I am minded to await until at least the next results to re-consider my ‘amber alert’. Next events: Ex-div 2 April, 0.46p dividend paid 1 May, possible full-year trading statement in July/August. The statement contained a mild profit warning. But given the circumstances — that is, GTC’s exposure to the challenges of the oil and gas sector — I was quite happy with the update. Market expectations were for pre-tax profits of £2.3m, so £0.3m higher than what will actually be reported. However, today’s update indicated the second-half produced pre-tax profits of £1.3m and revenue of £4.9m — not a bad performance when the first-half saw pre-tax profits of £0.7m and revenue of £3.6m. Before becoming too excited, I will have to see these annual figures in full. My Blog post above noted GTC’s H1 profits were flattered by some unusually large development expenditure being capitalised on the balance sheet, and I wonder if H2 profits have been flattered in a similar fashion. Turning to valuation, I am guessing the core business delivered a £1.85m operating profit and ERCL contributed just £0.15m during its 4 months of ownership during the year to July 2015. Let’s also say ERCL can bring in £400k for a full year. 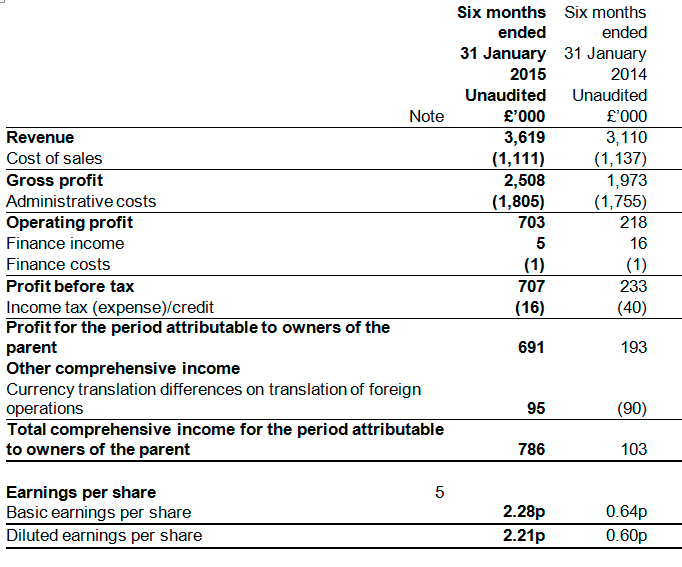 So pro-forma trailing profits could be £2.25m. Less £28k interest on the debt taken on to buy ERCL, then tax at 8% for the core business (R&D tax credits) and 20% for ERCL, and I make pro-forma earnings to be £2.0m or 6.13p per share. My ‘truly surplus net cash’ from the Blog post above was 1.6p per share after the ERCL deal. So with the shares at 52p, GTC’s enterprise value (EV) is 50p per share. The P/E on my EV and EPS guesses is 50p/6.13p = 8.2. The trailing dividend is 2.22p per share and supports a 4.3% income. As I wrote in the Blog post above, I still like Getech for its proprietary data products, asset-rich balance sheet and ‘thin cat’ management team. The shares do not look expensive either. But I am still minded to await until at least the next results to re-consider my ‘amber alert’ following the ERCL deal — and double-check whether reported profits continue to be flattered by the shifting of development costs on to the balance sheet. Nonetheless, I am quite pleased with the statement today and management’s upbeat view on the group’s prospects — despite the oil and gas customer base experiencing difficulties.